20 String Players, 2 F-Horns, 1 Clarinet, 1 Trumpet and a conductor….not a problem for Chaton Studios. 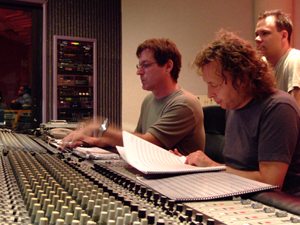 In July of 2006, Dan Malone and Mike Markowski had the pleasure of working with Chaton Studio owner Otto D'Agnolo and composer Peter Manning Robinson for a tracking session for some of Robinson’s new works. For the Chaton Sessions, Dan was brought in for his knowledge and techniques with regards to working with large string ensembles.